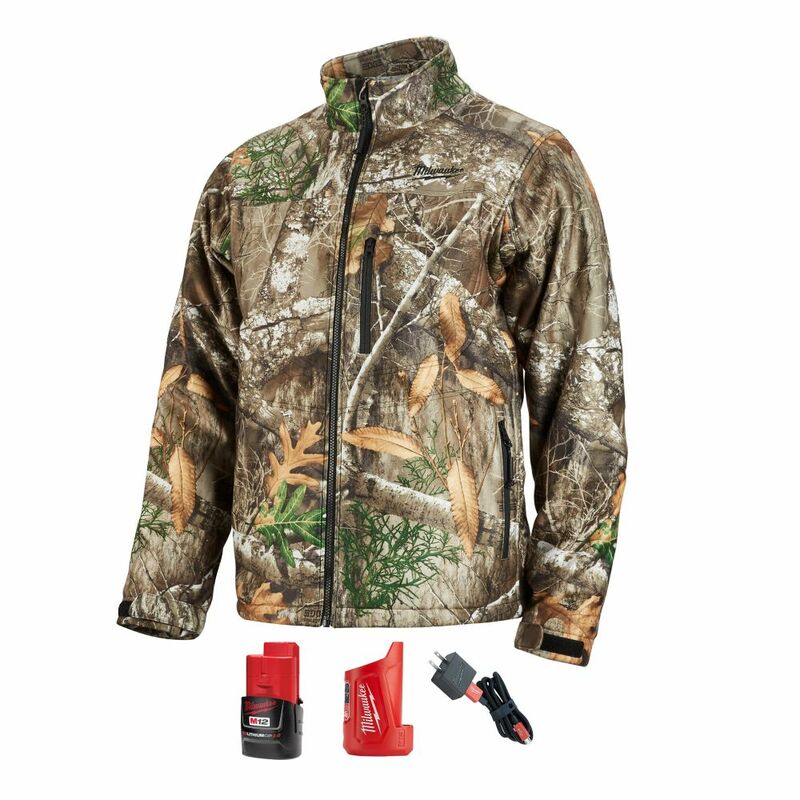 Men's Large M12 12-Volt Lithium-Ion Cordless Realtree Camo Heated Jacket w/ (1) 2.0Ah Battery The large Realtree camo heated QUIETSHELL jacket kit is powered by the M12 REDLITHIUM battery. Each heated jacket uses carbon fiber heating elements to create and distribute heat to the chest, back and front hand pockets. A single touch LED controller heats up the battery heated jacket to three heat settings. The MILWAUKEE heated jacket kit's Quick-Heat funtion heats up three times faster than previous jackets and market competitors. The heated hunting jacket also features Realtree Edge camo pattern. The QUIETSHELL stretch polyester material reduces noise from movement and provides wind and water resistance. This kit comes with one heated jacket, an M12 battery and compact charger and power source. Men's Large M12 12-Volt Lithium-Ion Cordless Realtree Camo Heated Jacket w/ (1) 2.0Ah Battery is rated 4.3 out of 5 by 15. Rated 4 out of 5 by Kyle from Works good, charger that comes with it is just a... Works good, charger that comes with it is just a usb cord and battery life is around 2 hours on high but I bought another battery so i can switch them out. Nice to have when hunting, not too bulky for archery and dont have to use gloves with heated pockets. I would buy again.